People of vision are not super-humans with ‘extraordinary’ powers; they’re simply people with a relentless resolve to live intentionally. Vision is the platform on which you can fulfill your purpose. You cannot conceive until you perceive. And until you conceive, you cannot birth or bring to existence. Your life needs direction more than you’re willing to admit and vision is the compass that provides that for you. 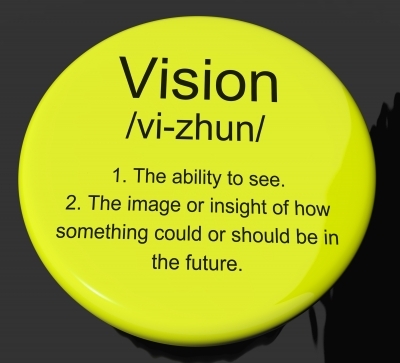 Leaders lead from vision, not wishful thinking. People constantly seek authentic leadership and will follow one with a solid vision. People of vision understand the big picture. But to make tangible impact in life, however, you need to discover your role in the big picture. This is what we call purpose. DESIRE: You must have a strong desire to know and develop your role out of the bigger vision of God. Your hunger and thirst for fulfilling purpose is a major ingredient to developing a personal vision (Matthew 5:6). If there’s no desire, there can be no pursuit. You cannot chase what you’re not desperate or don’t see a need for. PRAY: You must commit yourself to earnest prayer and seek God’s face to reveal ‘something’ tangible to you. God knows our individual life purpose and we can discover (and develop) it by earnestly seeking His face. We can unlock the hidden treasures of heaven that pertain to our lives through prayer. WRITE: Make the vision plain – mentally and visually. A written vision can hardly be forgotten. It will serve as a daily reminder until it becomes part of who you are. Don’t just ‘picture’ it, describe it in written words. Now that we have the basics covered, what other concrete actions can people take to develop their vision? I’d love to read your experiences and thoughts.